I’m sure every couple has at least one episode of smuggling unauthorized purchases into the home, whether it be bicycles (Paul), books, (Michael), or other things that would probably be okay, but the negotiations for acquisition would be too protracted to be practical at the point of sale. Hey, even Howard from “The Big Bang Theory” did it on more than one occasion. Tim the Tool Man did it as well on “Home Improvement”. I’d like to say those exposures contributed to any delinquency of which I might be guilty, except my practice far predates either of those programs. Okay, the story at hand. In my years of electronics experimentation and ham radio, I’d often had need of an oscilliscope. 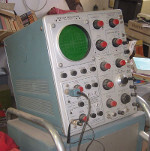 I didn’t want a Heathkit, though, my tastes run to pro tools, in the case of ’scopes, only Tektronix would do. But, they’re pricey. A friend did loan me a portable Tek he had used in his work, but since he worked for Howard Hughes (true story) he was able to upgrade his stash periodically, and this one was surplus. Unfortunately, I was never able to get it to work. However, one year at our local hamfest, someone had a Tek 535, on a cart, at a price which was affordable, but lets say, not in the budget. I had sold a couple of radios I think, so I had cash in hand, and loaded the behemoth into my van and brought it home. I took advantage of an absence of bride and wrestled the thing down to my radio lab. I use the words “behemoth” and “wrestled” specifically because this is a laboratory grade o-scope with laboratory grade dimensions. The ’scope itself is 13" wide by 16" high and 24" deep. It weighs 66 pounds. I don’t remember what the cart weighed, but it wasn’t light duty, either. I got it in its new home and settled back upstairs to bring in the groceries. They say confession is good for the soul, or some clap trap, but I think it takes some time for that bonhomie to pupate. I had to pay for that for some time. However, it’s eventually matured to a good family story about which we chuckle now and again. And the coda, the ’scope’s long gone. It could not have survived the double downsizing we’ve done since leaving Illinois. In fact, I don’t think it left Illinois. I hope I got it a good home. NB: in the first pic, behind the ’scope on the left is a National NC300 (or maybe a 303) receiver. I had one of those when I was a Novice back in the ’60s. It was long gone before this tale played out.